Director Brad Peyton’s summer disaster epic “San Andreas” is filled with plenty of eye-catching, cutting-edge CGI spectacle, the cartoonish kind Hollywood has been conditioning us for years to accept and, at least in my case, surrender to. The human story, though, is refreshingly old-fashioned. Themes of family, duty, sacrifice, and self-reliance abound. It is all as fun and unfortunately as forgettable as an amusement park ride. Anchored by Dwayne Johnson, who has risen from 15 years of metrosexual smoke to take back the action hero mantle for oppressed masculine alpha males everywhere, “San Andreas” is the story of a family blown apart by personal tragedy before being involuntarily thrown back together by a harrowing natural disaster. 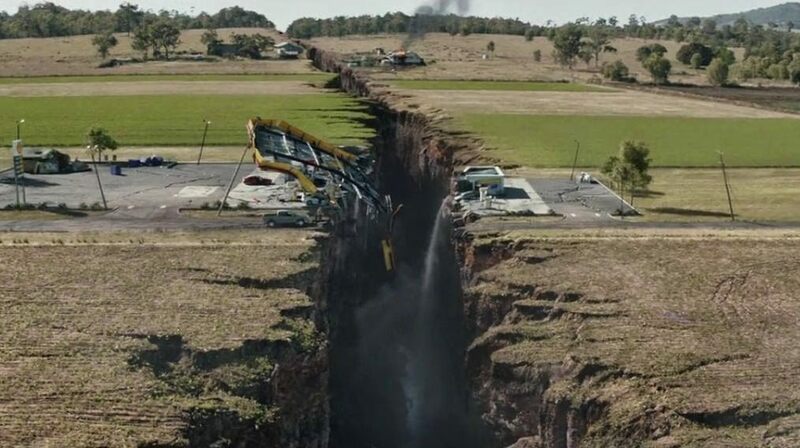 That natural disaster is, of course, a massive earthquake that starts at the Hoover Dam and makes its way (over the course of the movie) to San Francisco. Caught in these rolling nine-point-somethings is the wife and daughter of Fire Department rescue-helicopter pilot Chief Ray Gaines (Johnson), who just happens to be alone in a chopper when all hell breaks loose. Gaines is tasked with flying to the Hoover Dam to help with rescue operations there when he learns that his estranged wife Emma (the lovely Carla Gugino, reuniting with Johnson for a third time) is trapped on the top floor of a swaying, crumbling downtown Los Angeles skyscraper just as The Big One hits. Gaines abandons whatever orders he has (Does he go AWOL? The movie never explains.) and commandeers the city’s chopper to try and save his wife, and later his daughter, who is trapped in the City by the Bay. In the middle of all of this is Lawrence (Paul Giamatti — who makes everything better), a Cal-Tech scientist who — in an absurdly absurd coincidence — cracks the code of predicting earthquakes just moments before the breaking loose of the aforementioned hell. The set-pieces are exciting, well-staged, and create a sense of real peril. The cast, which plays it admirably straight, does a better job of even the CGI in selling the whole scenario, especially Johnson, whose growth as an actor continues to amaze. He has a couple of big emotional scenes to sell, and does. Sadly, the only real difference between “San Andreas” and last year’s just as forgettable “Into the Storm,” is this cast. And that is not a small difference. As troubled as the family dynamic might be, these are still nice people. You don’t see many nice people in movies anymore. Even the teenage daughter Blake (Alexandra Daddario) is a welcome vacation from the dark, mouthy, surly teenage daughters that seem to pop up these day in films everywhere. Blake is plenty mature, smart and resourceful, but in another refreshing departure from too many movies nowadays, she’s not the parent to parents who never grew up. The knowledge that might save her life comes from listening to her old man. In every respect, you want this family to find a way to get back together. 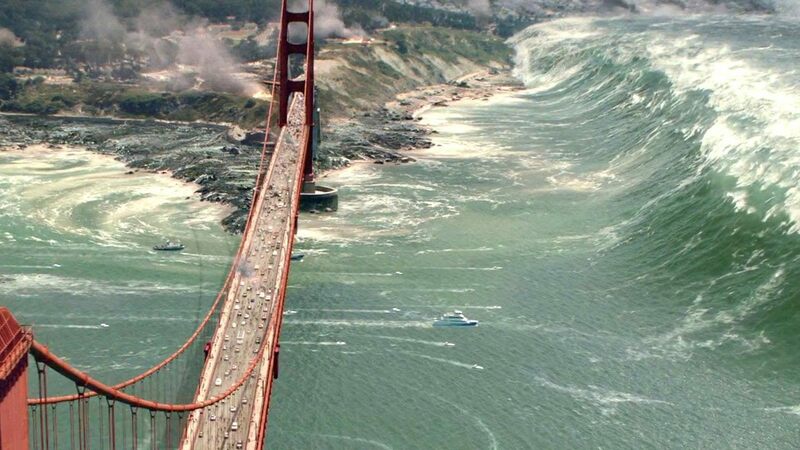 “San Andreas” is shameless escapism, including an escape from detached irony and cynicism. Like “Into the Storm,” though, “San Andreas” vanishes without a trace. The two-hour experience feels more like playing a video game than being told a story. Engrossing, for sure, just not in a way that makes you care for one minute longer than the actual experience. Peyton and his screenwriters try. America and God get a nice closing shout-out. By then it is just too late. You could also wait for Redbox.